MRS CMM Modular Rack System - CMM Inc.
For optimum CMM functionality, the MRS Modular Rack System provides a platform for Renishaw probe and stylus changing racks. This system in particular, offers a flexible platform where the user can effectively and efficiently combine probe and stylus changing. The MRS Modular Rack System consists of a rail (400 mm, 600 mm or 1000 mm long) that holds the probe or stylus changers, and interconnecting legs of selectable lengths that allow clearance for long styli and extension bars. The rail is compatible with the SCP600 and SCP80 (stylus change ports for SP600 and SP80 respectively), the ACR3 autochange rack and the FCR25 (stylus and module change rack for the SP25M). 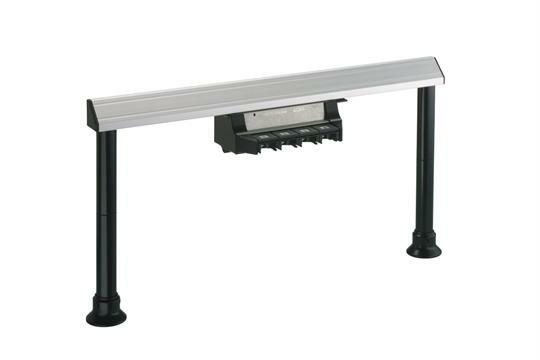 MRS rails are available in lengths of 400 mm, 600 mm or 1000 mm. MRS legs are available in lengths of 62.5 mm and 125 mm. The Renishaw modular rack system kit includes the MRS rail and the necessary legs (4 × 125 mm) and fixing feet. Kits are available with a MRS in lengths of 400 mm, 600 mm or 1000 mm.